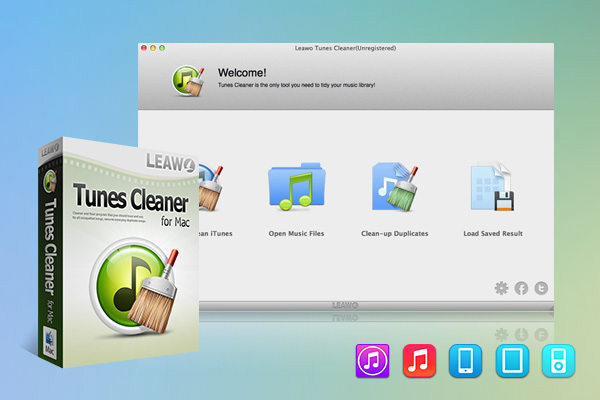 Leawo Tunes Cleaner for Mac is an intelligent smart iTunes cleanup tool to seamlessly organize and repair your iTunes music library within few simple and easy clicks. It could help you delete duplicates in iTunes, get album artwork for iTunes music files, add missed information including artists and album, add music information by searching key features of music files under manual input. Based on the powerful online database, this iTunes cleanup tool provides massive fixes fast and accurately. Besides, the initiate scoring system brings totally different experience for you to show you the iTunes music library health. By automatically scanning your iTunes music library, Leawo Tunes Cleaner for Mac saves you time and energy, and makes the iTunes cleanup operation process clear and simple. Through iTunes cleanup, your iTunes music library would be well organized. By synchronizing your music to iTunes, you could also make the music collection in your MP3 players cleaned and in a good organization. Key features and functions of Leawo Tunes Cleaner for Mac: Detect and delete song duplicates in iTunes or music folders. Advanced Acoustic Fingerprint technology to detect and delete song duplicates. Add music information including artist, album, album artwork, song name, year and genre to complete music files. Manually fix music files to complete music tags. Allow users to determine which kind of music files to fix at will. Powerful online database for massive, fast, and accurate fix. Unique scoring system to show your iTunes music library health. Delete songs without source files in iTunes music library. Easy to use interface with simple program operation. Open external music files of iTunes music library for repairing and fixing. Save unfixed music files for future fixing easily. Apply fixed music files to iTunes music library/music folders in a click. Fancy elements app. allows to create awesome web graphics without spending hours in Corel, Photoshop or Gimp! Now you can make fantastic badges, buttons, stickers, tags, arrows, ribbons, tooltips, banners, in just a few clicks! This site does not contain serial number, crack, keygen Leawo Tunes Cleaner for Mac serial number : serial number is the simplest type of crack. A serial number(cdkey,product key,etc) is register the program as you may already know. a crack or keygen may contain harmful software. If you cannot find the exact version you want, just give it a try. for more information read .nfo/.txt/.diz file include in zipped file.